Finally, after a whole month of “Flores de Mayo”, the activities climaxed on May 31, 2013 at the Blessed Trinity Cathedral in Talibon. 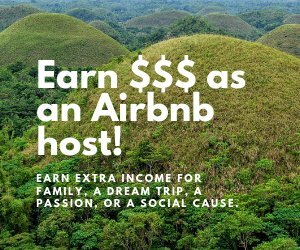 Talibon is one of the prominent towns of the province of Bohol in the Philippine Archipelago and is the seat of the Diocese of Talibon. The activities lined up in the afternoon were to give tribute to the Blessed Virgin Mary as the “Lady of All Nations”. Afternoon came and the Cathedral was a flurry of activities. 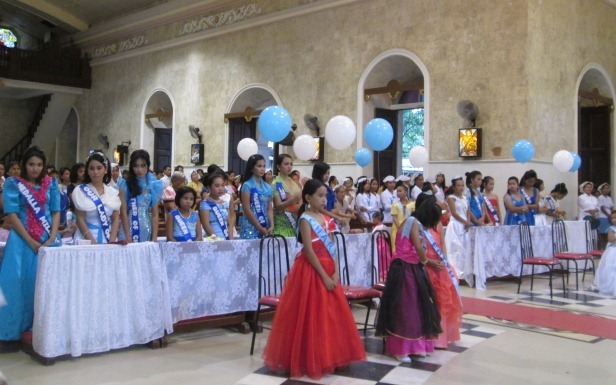 A decade of the Rosary was said, then the Flores de Mayo novena with flower offerings; and then the procession of the image of the “Lady of All Nations” followed by beautiful teen-age and little girls, some representing the different nations of the world while others carry the different names attributed to the Blessed Virgin. The lay faithful, composed of the parents (mothers mostly), church workers and members of different church organizations, joined in. 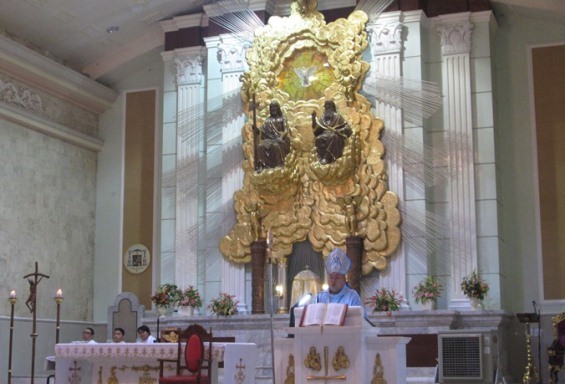 A Pontifical Mass followed right after the procession. His Excellency Most Rev. Christian V. F. Noel, D.D. Bishop of Talibon was the main celebrator. He was assisted by Msgr. Jonathan D. Pacudan, Rev. Fr. Adonis L. Madanguit, Rev. Fr. Randy N. Boiser, and Deacon Mark Neil Eronico. The Bishop, during his homily, read, word for word, a homily of Pope Francis on the Blessed Virgin; translated it line by line and gave the homily in the vernacular. Pope Francis called on all the Catholic faithful to turn to Mary for she is the Mediatrix of All Graces. She is our mother. She knows what we need. We have to turn to her for everything for she is our mediator and Jesus never refuses his mother anything! During Mass, the image of the Blessed Virgin Mary was crowned and at the end of the Mass, the little angels offered her a shower of floral petals. To cup it all, a children’s bazaar was held the next day. All those who attended the month long activities were given tickets and allowed to exchange them with their desired school supplies during the bazaar. The kids were also treated to refreshments.